Glass breaking sensors are installed at all windows.Magnetic sensors are being used to check if doors or windows are opened. The use of motion sensors was not possible because of the presence of pets. The access code for the delayed zone must be entered on a keyboard. I have opted to use the Velleman kits key lock. I modified the kit a little bit to make the LED light up when the delayed zone is active. 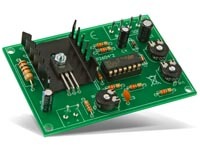 A second modification was done to the relay: it now only gives a small pulse when the correct code was entered. A third modification was the addition of a small buzzer. It will start beeping when the door is opened. 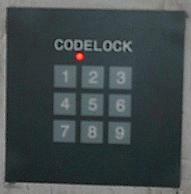 This notifies the inhabitants the alarm is active and a code is expected. If no password is entered within 15 seconds the sirene is activated. The sirene is build with another Velleman kit: the Kojak sirene. I have chosen for this siren because the kit offers a lot of different output sounds. The alarm is turned on and off by a control panel. This panel was already present before I designed the alarm. All I had to do was to make the alarm compatible with the control panel.